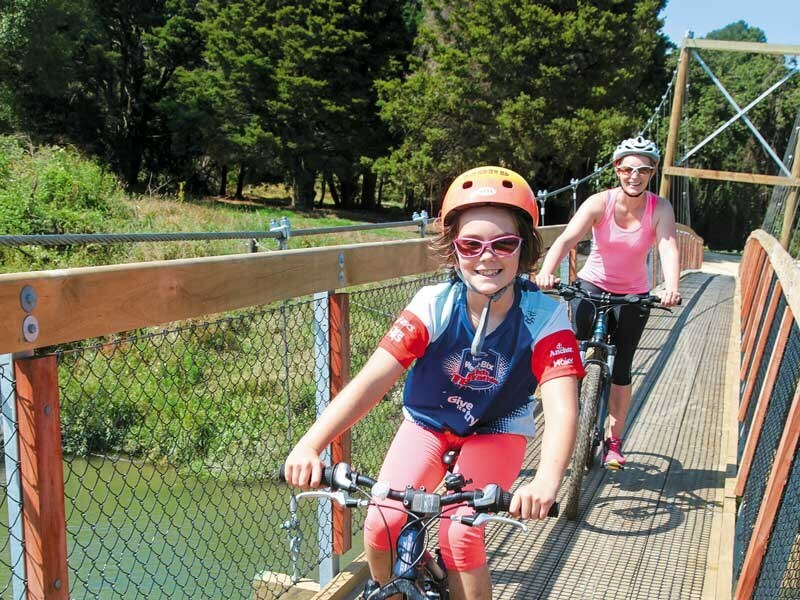 In our town, a network of limestone cycle and walking paths has been taking shape for a few years, and last year, a 100-metre-long swing bridge was completed, connecting the east and west banks of the Tukituki River. 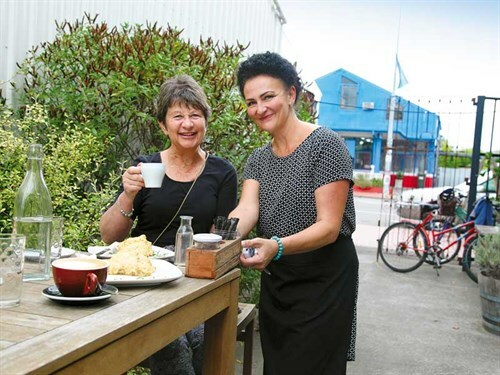 It means we can cycle to Waipawa, seven kilometres away, or in another direction, along the stop bank and arrive at the Waipukurau traffic bridge. I decided to make two trips of it. My niece Tamsin, her husband James, and their 10-year-old daughter Eleanor arrived for a visit in the new year, loaded up with their mountain bikes and keen to try out the new loop. 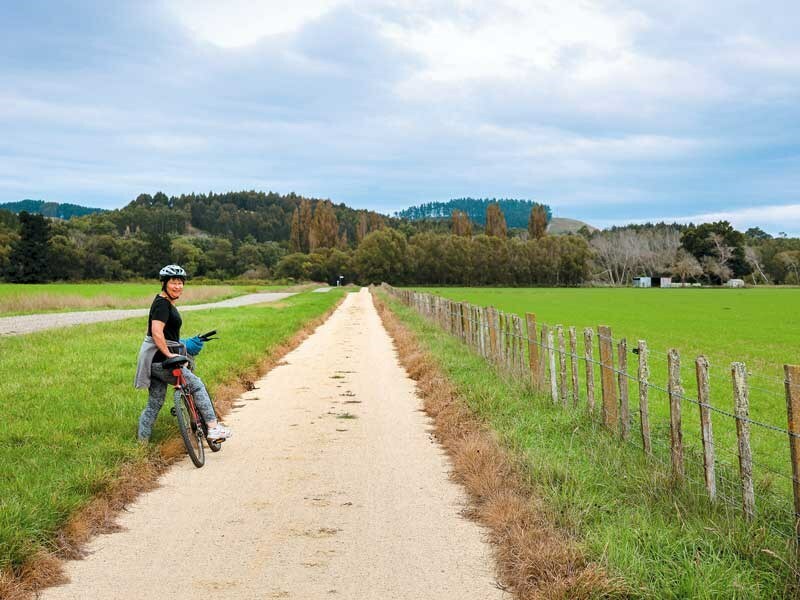 The Tukituki trail has a mountain bike trail running alongside it for some of the way and Eleanor was keen to get some dirt under her wheels to test out her relatively new bike. Utilising the stop bank and laying it with limestone is a great idea and the elevated view over the farm landscape is magnificent. The paddocks were full of the bounty of summer—acres of flowering squash and the tall stacks of maize. Once we reached the traffic bridge in Waipukurau, we headed home because it was swelteringly hot. Our round trip was about 15km. 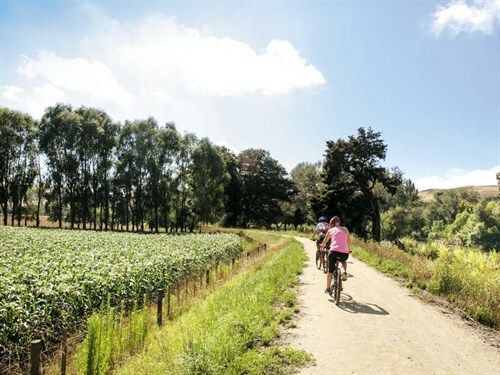 Alternately, you can explore further north of the bridge, ending up at Lyndsay Bush (also known as Tukituki Reserve)—a 9.8-hectare native bush reserve. My friend Rae Walker accompanied me for this one. We started along the stop bank beside Russell Park. It was definitely nicer biking in cooler weather and as it was mid-week, we had the place to ourselves. 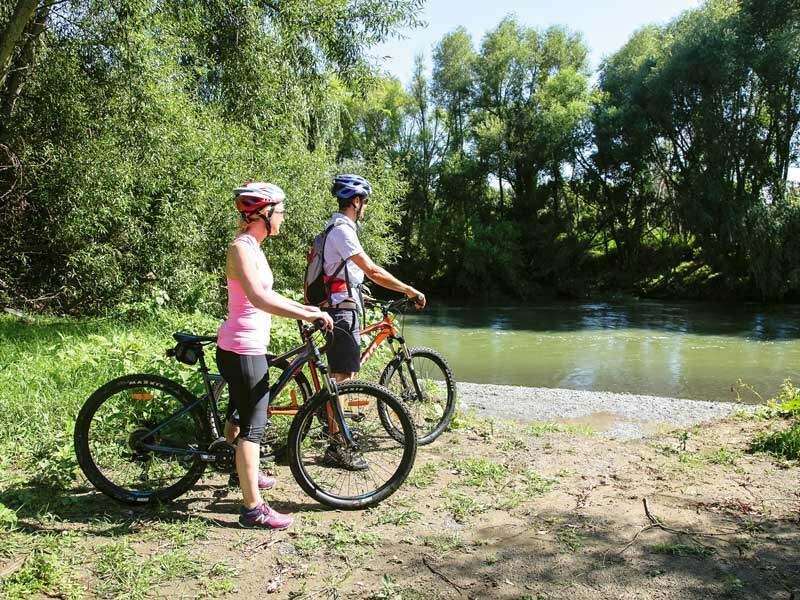 After crossing the bridge, we pedalled off in the direction of Waipawa. 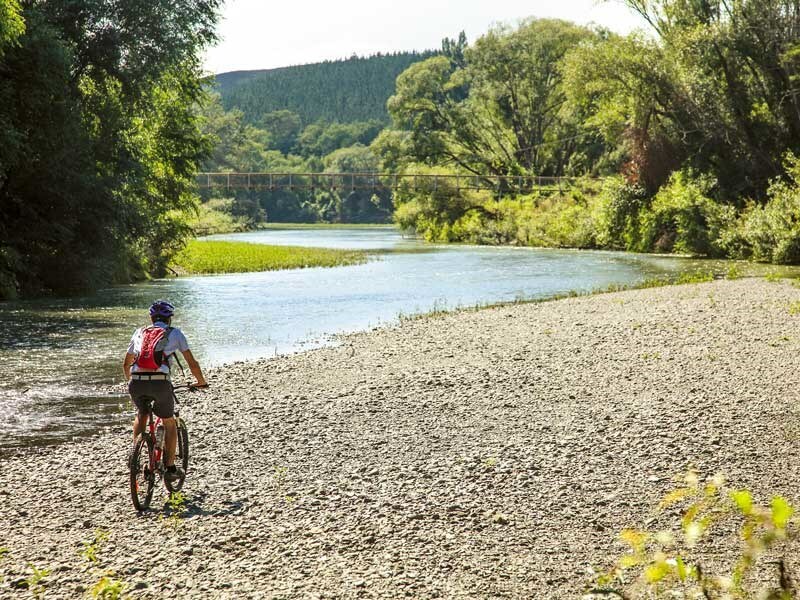 Along the way, we noticed stacks of firewood ready for cutting and colourful beehives, cattle grazing, and a rustic barn before cycling uphill, which wasn’t too challenging. At the end of the road, there was good strong coffee and giant cheese scones waiting at Café Nola. 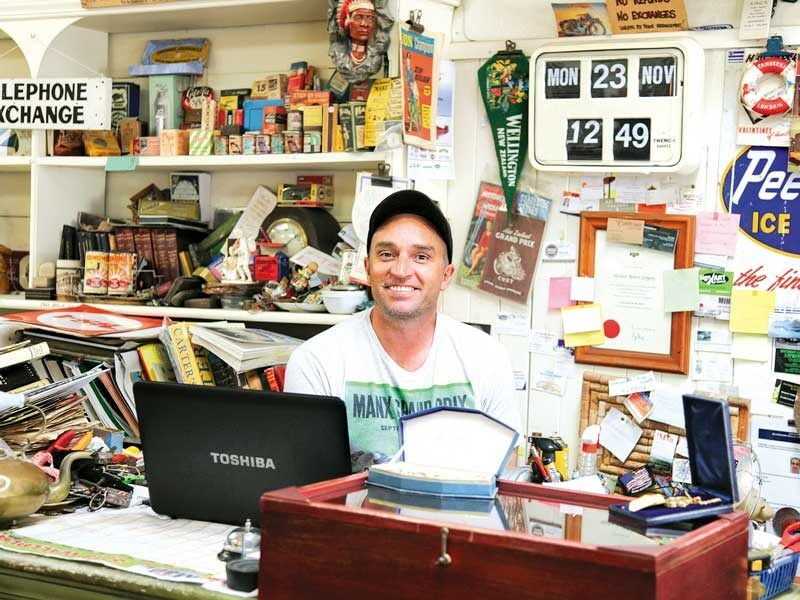 Waipawa is also home to Bay Country Antiques, which is packed with pre-loved treasures, and the CHB Settler’s Museum, where there’s an exhibition of the history of art in Central Hawke’s Bay. Our final stop (on the other side of the Waipawa traffic bridge) was at Te Nakahi Parahi—a historic church built in 1900 in memory of Hori Ropiha, a vocal supporter of Maori land rights in the 1800s. 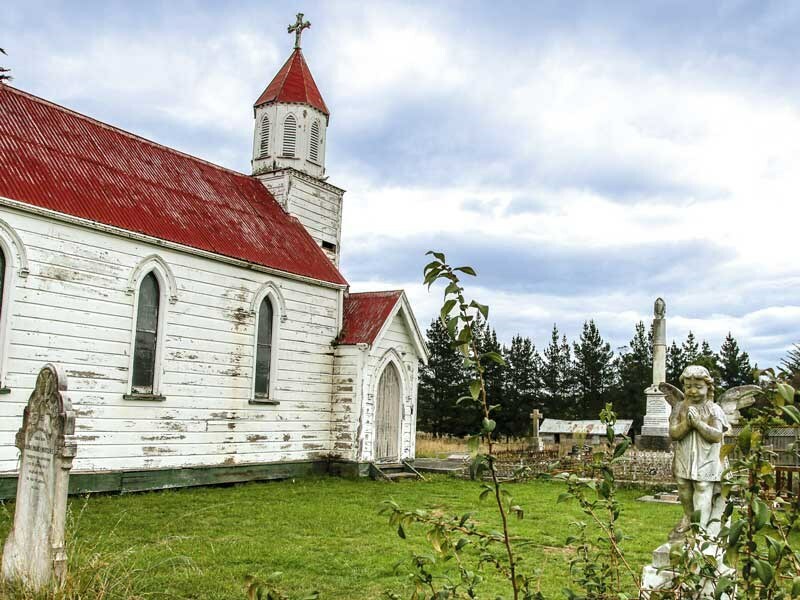 It needs some restoration and love; nonetheless, the simple wooden church and the urupa (cemetery) with its marble statue of a soulful-looking young Maori woman is fascinating. From here, it was a downhill run to the swing bridge, taking us back to where we started. 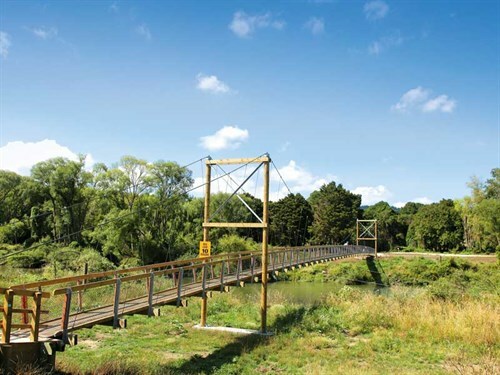 The swing bridge initiative was spearheaded by CHB Rotary’s River Pathways Trust, and $150,000 was raised through community efforts towards the $225,000 project. For more information, visit facebook.com/TheTukitukiTrail or tukitukitrail.com.